This vegan fried appetizer made with besan & potatoes is crispy & crunchy. 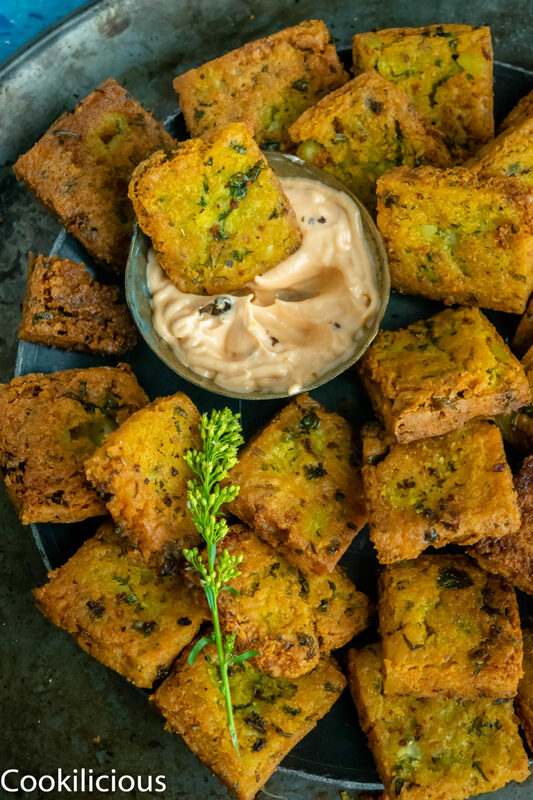 If you are looking for a quick & easy snack for your next party, give this a try. I had the most fun creating this party snack! I even mentioned it on my Instagram Stories that making this appetizer gave me lot of joy. Just the recipe and technique used to make them was an enriching experience. I had never prepared a snack similar to this one and that is what excited me the most. 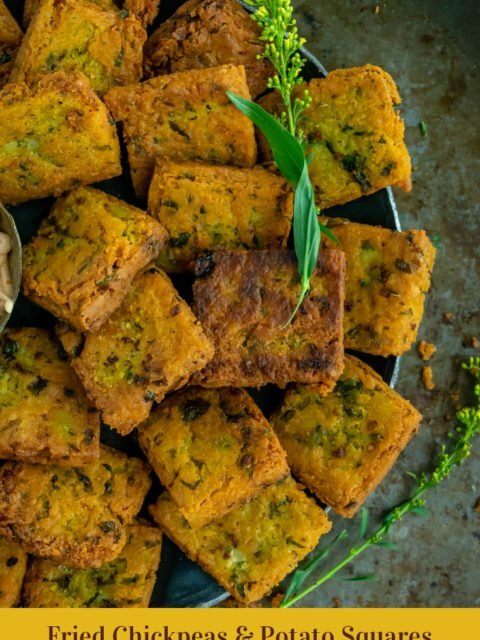 This truly is a unique snack that is a crowd pleaser for sure! I can say that because I did make it for a potluck and everyone went crazy. It was all gone within of serving. 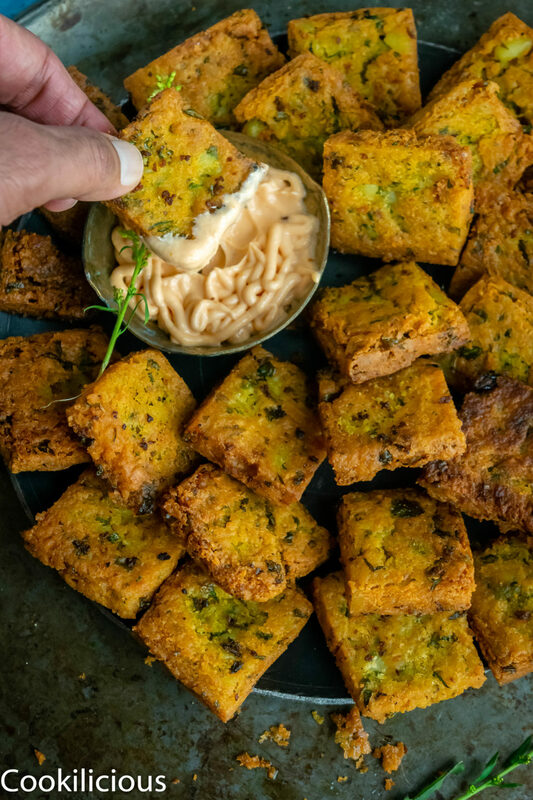 That I think is a sign of a great appetizer that’s fit for a crowd. Of course food is the highlight at any party and the first food to come out of the kitchen sets the mood. There is a lot of pressure on the party appetizers as they will make or break your party mood. SO it is essential that the first finger-foods that go out are the best and stand out. Once the guests like the food served, they will relax and loosen up. If cocktails are important in a gathering, so are the snacks served. I always take a lot of pride in my snacks. I enjoy making them but what I enjoy even more is watching it being relished or devoured by my guests! That gives me immense satisfaction as a chef. It is always nice when your guests enjoy the food made by you and are very vocal about it. Whenever I am in need of any creative inspiration, I call my Gujju friend. Her mom always gives me some recipe idea. 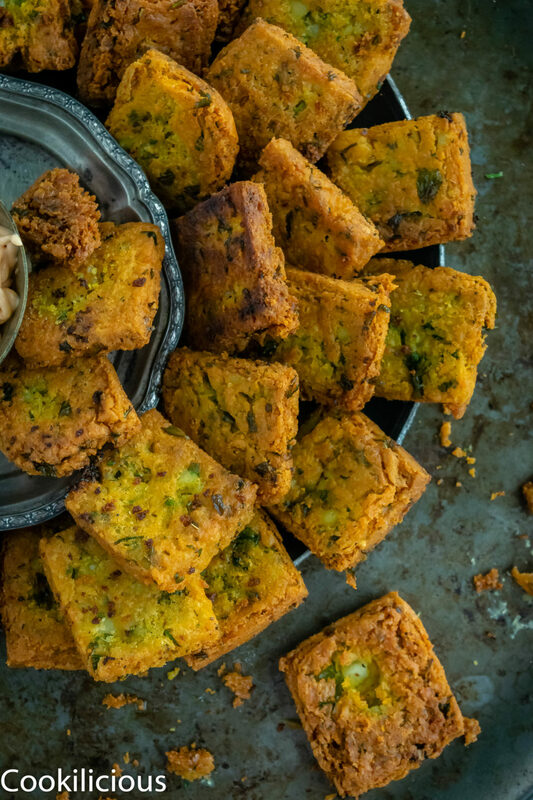 I think, all Gujaratis have a knack of coming up with innovative recipes, in my experience. I would love going to this friend’s house for home study during college years. Her mom would make a new snack every time and most of them would be unheard of. It would be her own personal creation and many didn’t even have a name. I would always ask what this dish is and she would just shrug it off saying that she just made something using whatever was handy. She was so oblivious to the fact that she was an excellent cook and it was not a big deal for her. I think she felt she was just doing her job. That is true to all moms I think. They do their jobs selflessly without expecting even a compliment back! They don’t even realize what wonders they create in the kitchens and each innovative recipe created in their kitchen is worth a shout-out. I was discussing this with my friend the other day. I told her, that if her mom even releases a cookbook I will be her first buyer. We laughed at that because we both knew that this would be so much out of character for her and just the thought oh her going out in public like this would make her tremble.
. Rest are all basic ingredients that are easily available in everyone’s kitchen/pantry. But the recipe technique is a bit different. She patiently explained the recipe to me and also provided all tips and tricks to ensure that this recipe was a success. I was super excited that I had procured a new dish from her. As expected, she didn’t really have a name for this dish and told me to come up with a name. Even though I know very well that she will not be able to read this post (as she is uneducated), I would still like to thank her on this platform and dedicate this post to her. It’s her recipe that I am sharing with you today. Hope you too enjoy this dish as much as I did and you do try it at your next event or gathering. It is a very simple and quick recipe.
. 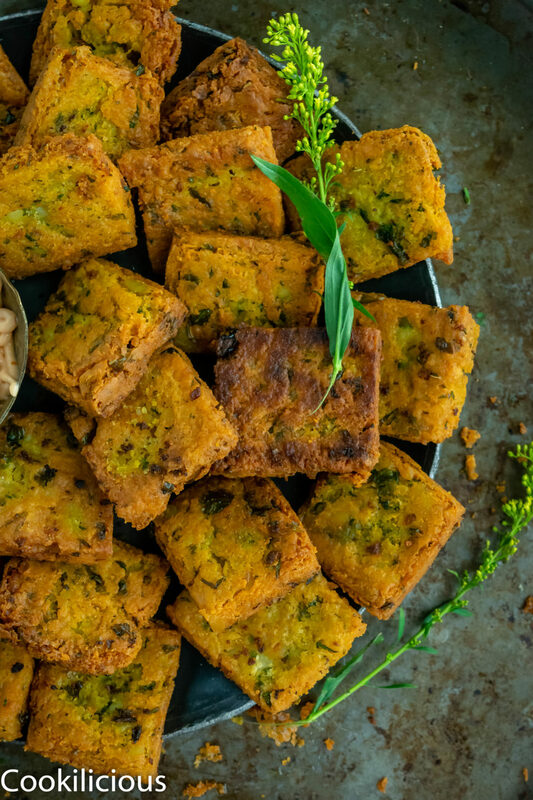 These Besan & Potato Squares are crispy, crunchy and extremely flavorful. The first step is to add chickpea flour/besan in a mixing bowl. Add chilly powder, turmeric powder, salt, cumin seeds and ajwain/carom seeds. Mix all the masala together and then add little water first. With a whisk/spoon give it a good mix so that there are no lumps formed. Then add the remaining water and make a thin batter. Add mixed herbs to it and mix. Heat oil in a nonstick pan and pour this thin batter onto the pan. Immediately begin to mix it and lower the flame. In about 2-3 minutes, this mixture will begin to thicken and not to the pan anymore. The key is to keep stirring it and cook it on low flame. Once a lump like mixture is formed take it off the flame. Let it cool down for about 5 minutes and then add boiled and grated potatoes to it. Also add salt, chopped cilantro and minced green chillies. It will be little hot but using your hands bring all of this together. Grease a cookie tray or a plate as well as your palms. Spread and flatten the mixture evenly (refer the pic above). Freeze it for 10 minutes. Meanwhile heat oil for frying. 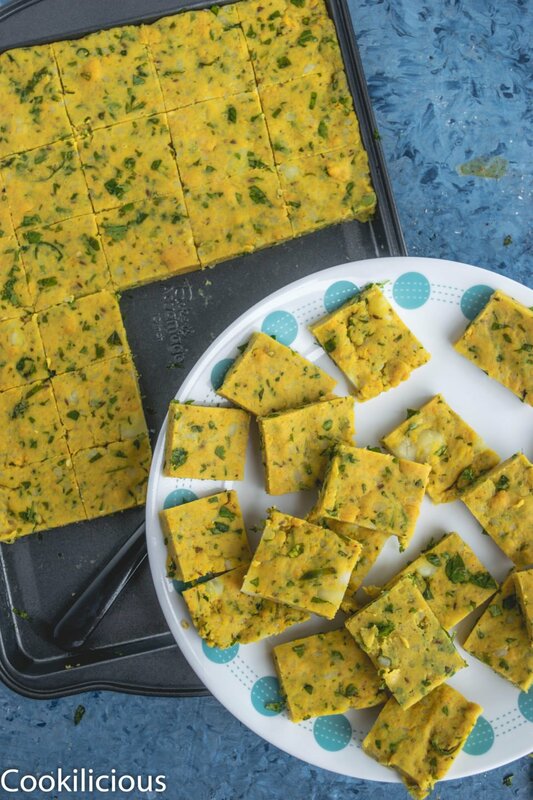 Take out the tray from the freezer, cut in squares. You can cut them in any shape you want. Fry the squares on medium flame. It should turn golden on both sides. Soak the excess oil using a paper towel. Serve them hot with chutney/ketchup. I’ve never used chickpea flour before. I am thinking now how it tastes, looks amazing! I can just imagine how tasty this is and I just love that it has turmeric in it!! YUM!!! Looks perfectly crispy and delicious. Yum!